You should change your resume every time you apply for a job. With that in mind, before you begin writing your resume you should make a list of all your work experience and skills you learned on your own, at a job, or in school. You want to create a master list of skills and work experience that you can use to pick and choose from as you make your resume custom to the job you are applying for. You do not need to list all your skills on every resume you submit, only the skills that apply. 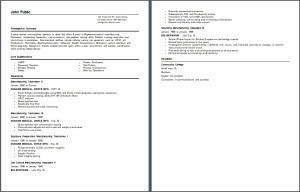 Hiring mangers spend about 6 seconds reviewing your resume before they decide if it contains what they are looking for. Read the job requirements listed in the job posting and update your resume to match. Having the list of skills you made first makes updating your resume quick and easy. If you don’t know what some of the words in the job posting mean, search for them in the Biotech Dictionary along the sidebar. If you can’t find them, send me an email and I’ll add them. Start making the list of your skills and experience now. List equipment you have used, techniques you are familiar with or experiments you have been a part of. On a blank page brainstorm and write down everything you’ve done. Keep breaking down your experiences to create lists of skills, experience, knowledge and work history that will create your resume writing toolbox. The next step is to format your resume.